In Part 1 of this post, I think I firmly established that the dirty little secrets at barns have very little to do with manure or rolls in the hay 😉 but have everything to do with human nature in all its aspects. I also described the journey of acknowledging the seeds of joy in each adverse situation, while knowing that bubbling quietly under the calm waters of good fortune, adversity can be just beneath the surface. It is all part of the balance of life. 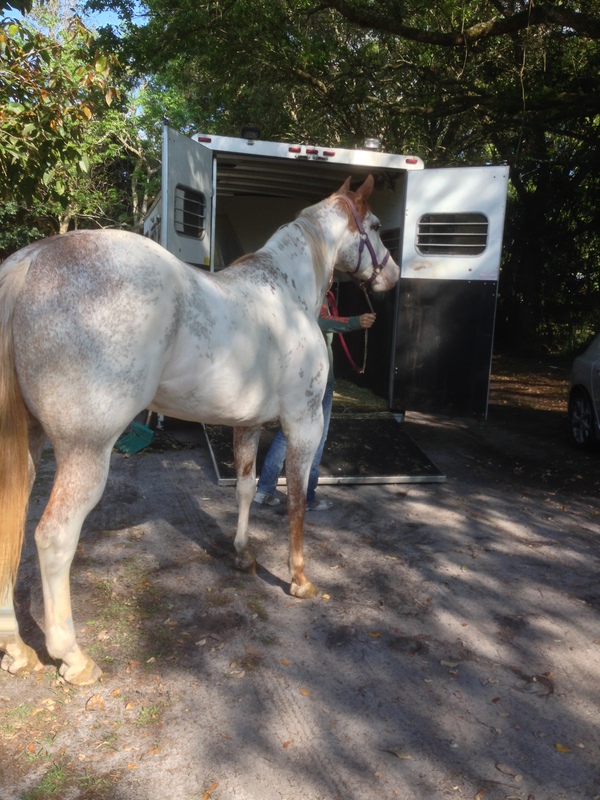 As life at the “fancy” barn became increasingly more intolerable for Spirit, Baby Doe and me, a final incident, described in the last post, gave me the tipping point I needed to help convince trainer Bryan help me to get my two out of there! And, simultaneously, events were occurring at the barn where I had once leased the glorious mare, Serenity, that opened up two stalls and had Felice, my former barn buddy, becoming manager of that barn. 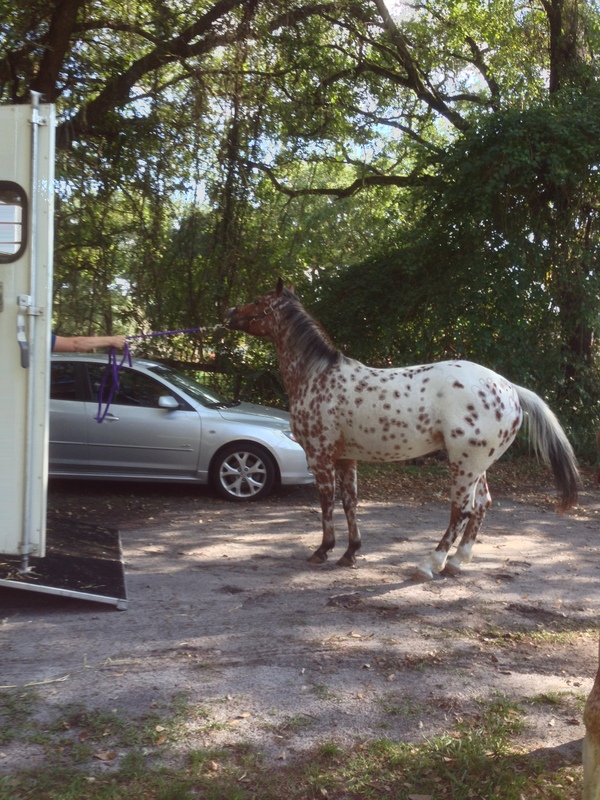 Within a week, my two were trailered and moved. As a “parting shot” from the fancy barn, an ugly situation occurred that erased any doubt from Bryan’s or my mind regarding leaving. Bryan had been fostering orphaned baby ducks on the property. As they grew bigger, more ducks were joining the flock. They were Muskogee ducks, not indigenous to Florida and many people are not pleased with their presence in our lakes and canals. Still, they are God’s creatures, too. The owner of the barn felt the presence of the ducks was hurting his chances at getting offers on his barn. One day, without consulting Bryan, he had some “men” come up from Miami, and there, at the barn, within earshot and sight lines of the horses, they strangled half these ducks to death and carted them off in their truck. (Probably to cook up at some restaurant for unsuspecting patrons.) Even writing about this, eight months later, causes waves of nausea, disgust and deep sadness to wash over me. 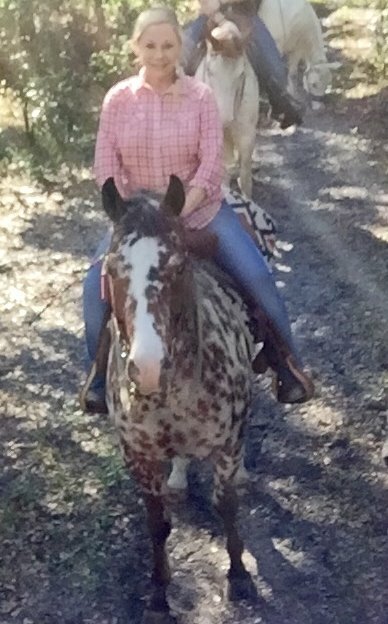 Felice had never managed a barn before and though it was only her Paint gelding (who, by the way is full brother to Baby Doe), my two, and a 20-year-old, noble gelding named Gismo, four horses are still a lot of horses!!!! It was a peaceful time. It was a wondrous time, as well. Felice and I began having groups of her special needs, autistic students come to the barn and interact with the horses on field trips. Every Saturday, there were at least 3 or 4 special needs kids that came to the barn to help us scoop manure, bleach water buckets, lay shavings and just laugh, enjoying the horses’ antics. Yet under the surface of the peace of these months, seeds of adversity were slowly maturing. Unbeknownst to us, the owner of the property was looking to list it and sell. We were finding we couldn’t give the horses turnout unsupervised, because the fencing was so rotted out that they could have gotten out, or worse, really injured themselves. It was too cost /time prohibitive for us to replace it and the owner refused. There just wasn’t enough grazing available. The horses were getting increasingly irritable and restless, being in their stalls long hours. Riding The Trails At Treetops Park. Baby Doe Is Directly Behind Me And Spirit. So, even though we had the superb advantage of acres of trails just outside the back gate, my two, at least, were having issues. There was not enough structure. Trainer Bryan didn’t get there as often as promised. Their youth required more experience than this Novice possesses. They were exhibiting increasing restlessness that would sometimes cause erratic behavior on the trails. Some differences in philosophy between Felice and me resulted in inconsistent human behavior with them. 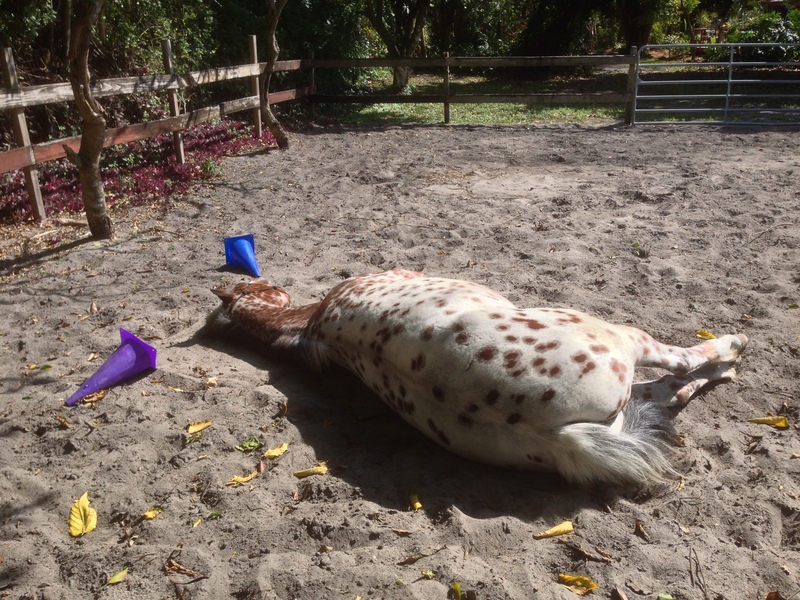 The sleepy seeds of adversity began sprouting above the ground when, at the first of the year, two new boarders took up residence at Felice’s barn, bringing their wonderful horses as well as their own big personalities and personal issues. On the surface, it looked like good fortune because these women were very experienced horsewomen, with experience with young horses! Given that, by now, trainer Bryan had his hands completely full at a new barn with students and horses and no longer had time for me, it looked like fortune had smiled. However, the next two months became a kaleidoscope of disparate energies. There seemed to be a team of outspoken “barn know-it-alls” coming up against me. My horses began displaying more irritable, aggressive behaviors. Time after time, I found myself not listening to my inner voice, sobbing through bouts of anxiety and not standing up for my truth. Ah, but then…one day…it was finally ENOUGH! I, FINALLY, stood up for my truth. I “made the fist”. One by one, with each human, I set boundaries (with kindness) as to what I would and wouldn’t do; as well as what they were allowed to do to me and my horses; or say to me and my horses. Oh, what a difference TRUTH makes! Within a week, a new trainer came into my life who was everything I could have hoped for. She and I are completely in sync with our philosophies and instincts about horses. Only she has the years of experience, knowledge and training that this Novice may not achieve in this lifetime. Everything, EVERYTHING changed for me, Baby Doe and Spirit. I will look forward to telling these stories in future posts! Then, good fortune truly opened up the floodgates. The owner of the property had found buyers. Shortly thereafter, in a single 24-hour period, the owner declared that once she closed on the property, the new buyers, with NO horse experience whatsoever, planned to take over management of the barn! Yet again, I had my two out of there within the week! God’s good grace and trainer Marianne found us the two last places at Cameo Farms. Cameo Farms, where things are peaceful and well managed with an experienced older couple. Cameo Farms, where there are acres and acres of pasture and turnout. 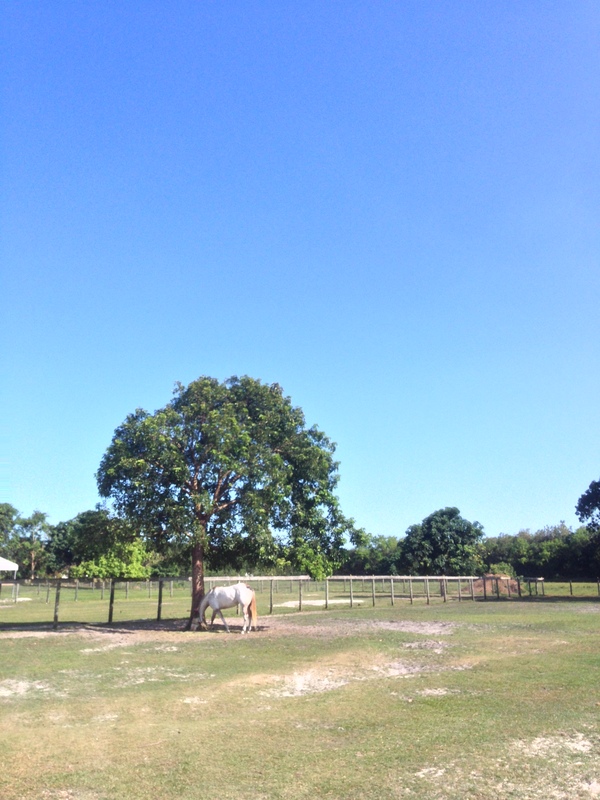 Where my two now sleep under the stars and graze to their horsey hearts’ content. 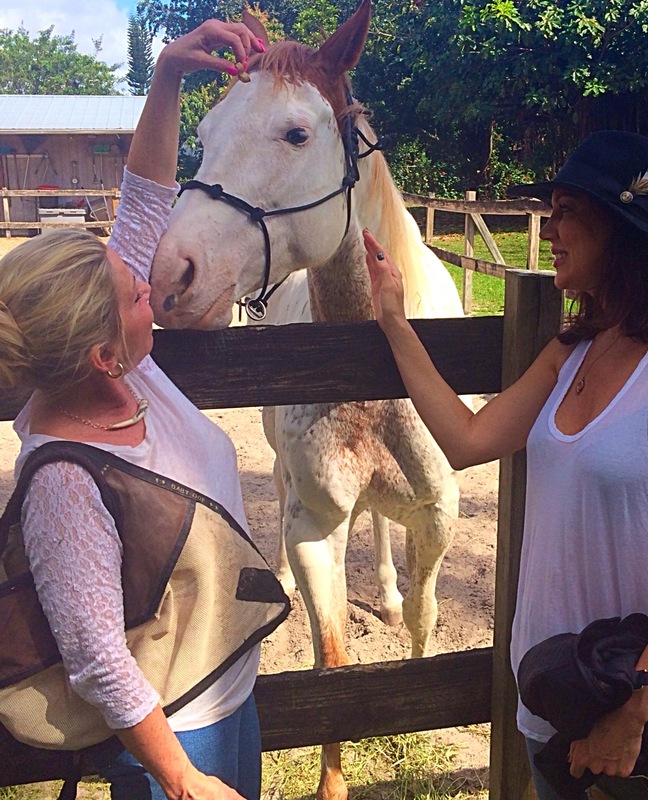 Cameo Farms, where trainer Marianne lives just a block away and has “adopted” us…me and my two… seeing us in such need of care and comforting. Cameo Farms, where in just a few weeks’ time, my two are blossoming with contentment and becoming their true horsey selves. What A Very Happy Appy, Spirit! However, this I know. Joy is always undergirding every adversity, every trouble in our lives. 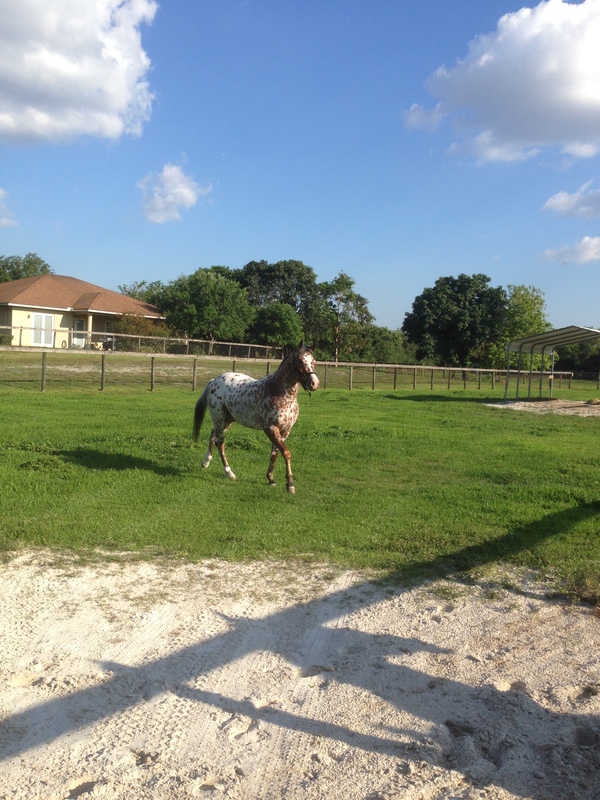 I gird myself with faith, hope and love as I continue on this journey of horses and… LIFE! 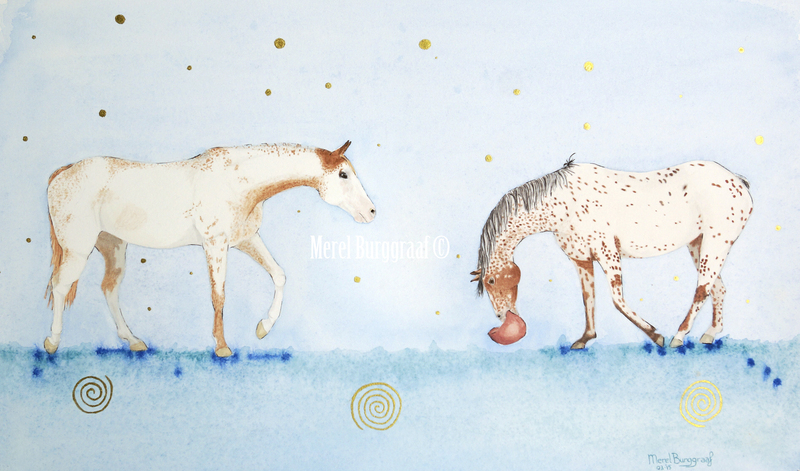 Afterword: I had commissioned a water color painting of my two from Dutch artist, Merel Burggraaf, since it is hard to get photos of the two of them together. Check out her website at: http://www.MerelBurggraaf.com. She is an exquisite and very intuitive artist. All these barn changes were happening as she quietly worked on the painting off of pictures and videos of Spirit and Baby Doe. I hadn’t told her anything about what was happening. So imagine my delighted astonishment when she sent me a photo of the painting she’s done. There they are, Baby Doe and Spirit, happily grazing under the stars! 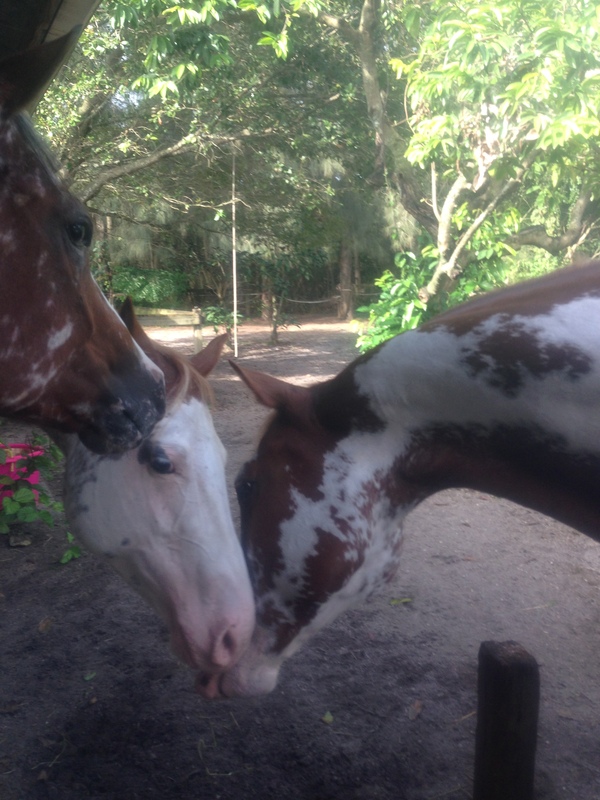 This entry was posted in Barn Lessons, Life Lessons, Personal Growth, The Novice Horsewoman Learns New Things, Understanding Barn Dynamics and tagged Adversity, Barn Secrets, Faith, Horse training, Human Nature, Joy, Truth on April 12, 2015 by Christine Hendler. Thank you very very much for you beautiful words about my art 🙂 I was on cloud nine when I read it! I am also very happy to see these new pictures of your horses. They are looking great and you can see they are feeling happy ❤ ❤ ❤ . I love them!! You SO “got” them and your painting shows this. Also your love for them is veryapparent in how you captured their essential selves ❤ Thank you again, dear Merel! It is said that dreams can align the stars in your favor. It is said that dreams can alter destiny. It is said that if your heart is pure and you crave to be loved and cherised, the Dream-Catcher could fulfill your wishes.